Algonquin Provincial Park in Ontario, Canada is a prime location to see a fabulous display of Autumn hues. The road to Rock Lake is a magical place where the leaves on the Maple and Birch Trees change into a mass of yellow, orange and red colors. The maple leaves have a distinctive outline to them, one that is highly recognized throughout Canada as it appears on the Canadian Flag. Each maple leaf is special as their points are all in different areas, they change colors at various times and drop to the ground at will. As the Autumn season nears its end, the road towards Rock Lake in Algonquin Provincial Park is blanketed in a mass of color creating a magical paradise for tourists, especially photographers. 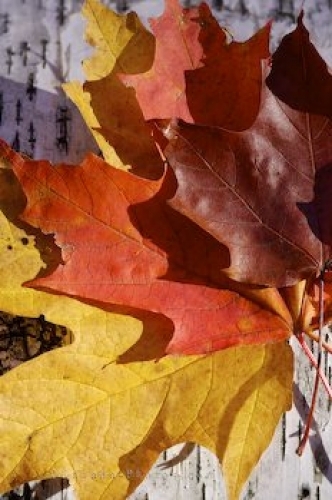 Picture of the Autumn colors on the Maple leaves in Algonquin Provincial Park, Ontario.